Getaways are tempting. Especially when the deal offers two worlds: elegant European style with American rustic charm. 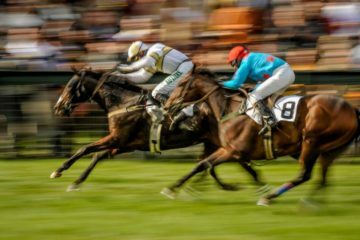 In Middleburg’s rolling landscape, an Airbnb property called Hunter’s Retreat, bids both. An equestrian couple from Great Falls, Virginia—Natascha Folens and her husband, Luc Dejager—wanted a place where they could ride out with their horses. They found their escape just outside the town of Middleburg, a short drive to all the quaint shops and restaurants the village offers. On 22 acres, Hunter’s Retreat is an historic stone and stucco house with almost 2,500 square feet and over 200 years of history, the oldest part dating to 1790. The property dead ends on Berryman Lane, which is off of Sam Fred Road (State Route 748), east of the town of Middleburg. The house has been completely renovated by Folens’ award-winning design firm, NF Interiors. In 2013, she was ranked as one of the top three interior designers by Virginia Living magazine. This Belgian-born designer brings a distinct look to her work on homes, hospitality and commercial businesses offering interior design, decorating and set-up services. Her work on Hunter’s Retreat was featured in Home & Design (July/August 2016) and in Milieu (Winter 2017). Hunter’s Retreat, an Airbnb just outside the town of Middleburg, dates to the 1790s. Photo by Heidi Baumstark. Folens and Dejager have given the house. As an international designer, Folens imports just about everything from Europe reflecting a unique, eclectic vibe like sculptural exposed heat pipes from Belgium and metal lighting with bare bulbs adding an industrial, modern feel. And with over 200 years of history, there are stories to tell. 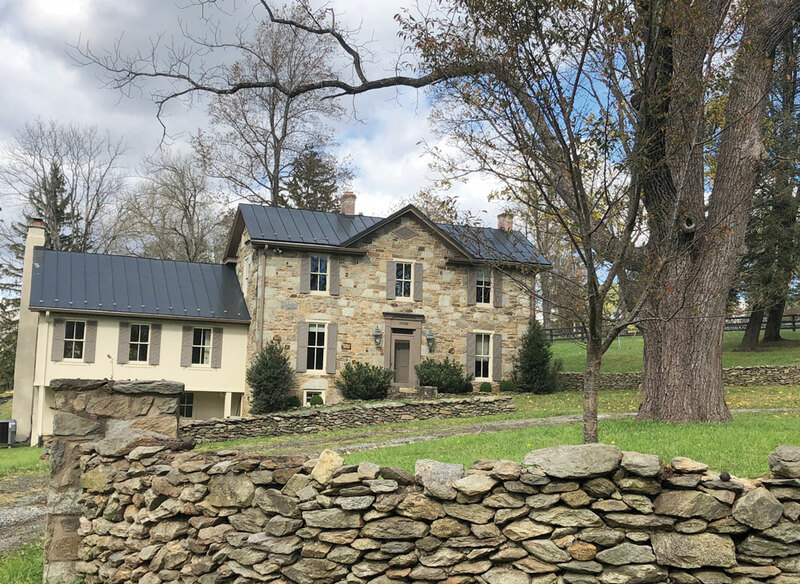 According to a 2004 document, “Loudoun County African-American Historic Architectural Resources Survey” by History Matters, LLC, during the period of 1790-1830, eight domestic properties in Loudoun were identified. Most of these dwellings were built for whites and later owned or occupied by African Americans. One example is the Raymond and Mattie Berryman House near Mountville, which dead-ends to a narrow trail/stream that flows to Goose Creek. The earliest part of this house may have been constructed as early as circa 1790. By the mid-1800s, the property was part of the James B. Wilson estate. Circa 1877, the original one-and-a-half-story stone house was expanded with the addition of the front, two-story center-passage; the nearby spring house has the year 1877 inscribed on the exterior. The 1900 census shows George W. Berryman (1856-1923) as a farmer as his occupation. He is listed as the head of household with Thomas J. (15 years old) and Raymond F. (11 years old) as sons; Thomas is listed as a farm laborer and Raymond was still in school. George was also a founder of the St. Louis Colored Colt Show. In 1922 after passing through several owners (with surnames as Wilson, Yates, Nichols, DeButts, Gordon), brothers Thomas and Raymond Berryman purchased the 130-acre property and house on Berryman Lane from Charles W. Dawson. According to local informants, theirs was the largest land holding held by African Americans in Loudoun County at that time. Eugene Scheel’s hand-drawn map includes Raymond Berryman’s property off of Sam Fred Road in Middleburg. The little block at bottom left of Raymond Berryman’s name indicates the location of Hunter’s Retreat, an Airbnb escape in Middleburg’s hunt country. Photo courtesy of Luc Dejager. 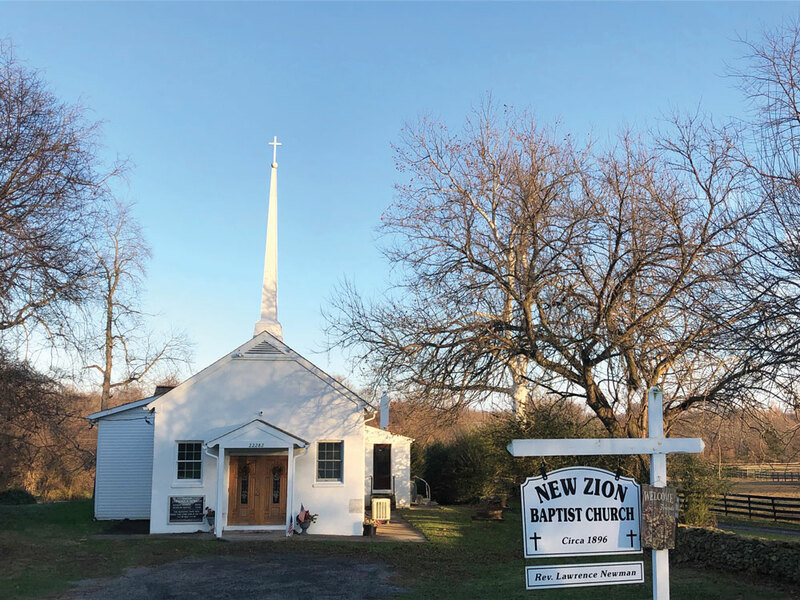 Today, the white steepled church where the Berrymans worshiped has an inscription in marble on the front exterior that reads: “Zion Baptist Church Built 1896 by Rev. Asbury Pinkett[,] Relocated and Named New Zion Baptist Church April 1970 by Rev. Earl King.” The church sits on Sam Fred Road just a short walk from Berryman Lane. In a phone interview with Scheel, he confirmed, “The Berrymans went to worship at New Zion Church on the east side of Sam Fred Road; the road was named after Samuel H. Rogers Fred, a wealthy landowner and farmer.” Sam Fred Road was previously called McCarty’s Mill Road. New Zion Baptist Church on Sam Fred Road is where the Berryman family worshipped. Raymond and Mattie Berryman owned what is now Hunter’s Retreat, an Airbnb on Berryman Lane. 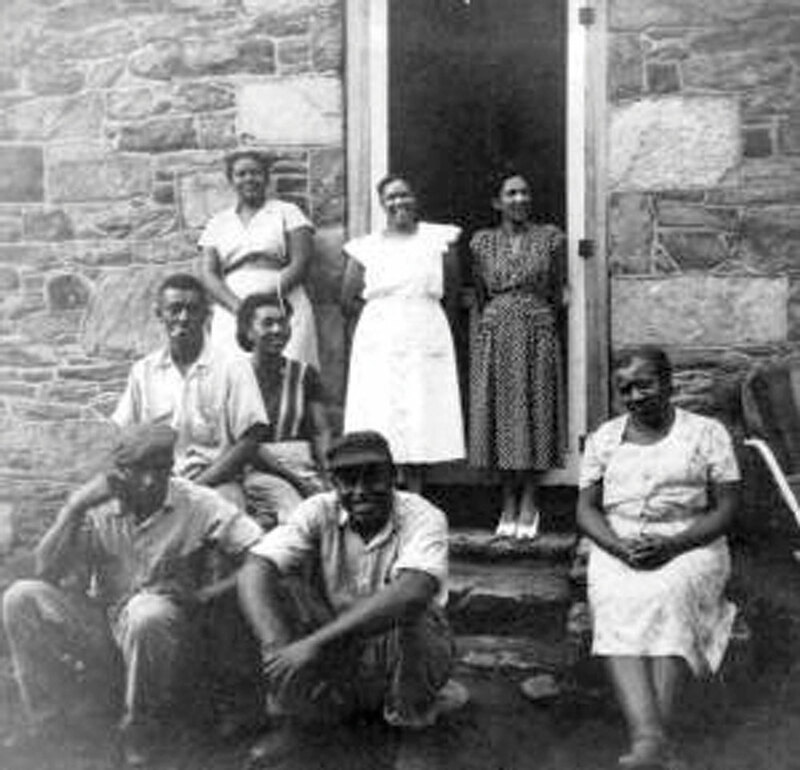 According to the Edwin Washington Project, Mattie Berryman worked as a teacher at Marble Quarry School in the 1940s; previously, she taught at a school in Lincoln, a small village in western Loudoun County, which was established as the community of Goose Creek during the 1750s by Quaker settlers and renamed Lincoln shortly after Abraham Lincoln’s 1860 presidential election. Scheel’s book, The History of Middleburg and Vicinity, describes a community called Marble Quarry that was made up of ex-slaves; the quarry had been mined by slaves of the Mount and Carter families. Benjamin F. Carter opened 400 acres of land for the quarrying of marble, and on March 30, 1870, the Virginia Marble Company was chartered and Carter sold the company his 400 acres for $26,666.66, which he received in company stock. The late Mattie (McQuay) Berryman (lower right) is pictured with other teachers at Marble Quarry Colored School (Mercer District) near Berryman Lane. Though the photo is undated, Berryman was a Loudoun County teacher in the 1940s. Courtesy of The Loudoun School Project, “Documenting Segregated Schools of Loudoun County” (https://loudounschoolproject.wordpress.com/schools/schools-m-through-r/marble-quarry-colored-school-loudoun/). 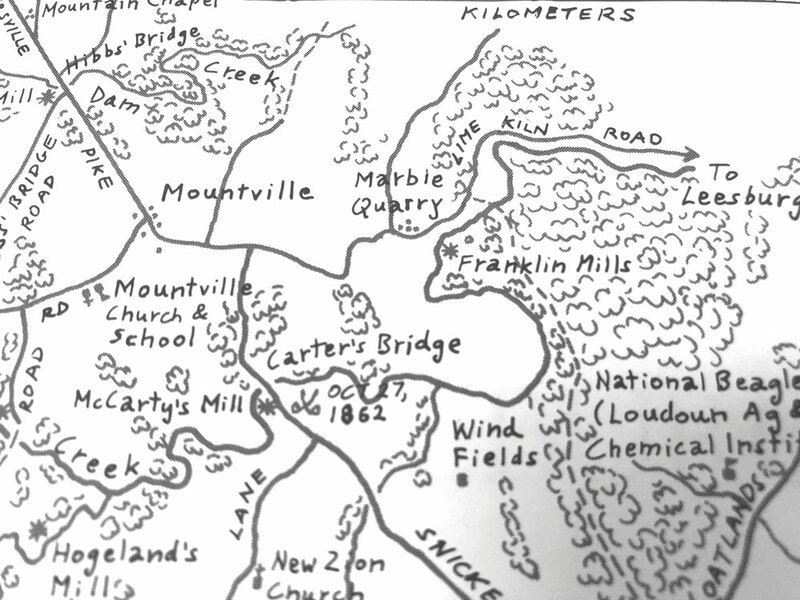 Along with the location of Raymond Berryman’s house, Scheel’s hand-drawn map shows other nearby places, events and names: Francis Mill, Hogeland’s Mill, Carter’s Bridge, Delta Farm, Groveton, Mountville School 1862, Mountville Church, New Zion Church and 2nd Marble Quarry. Also shown is a map symbol for a skirmish with the date of “Oct. 30, 1862” near Carter’s Bridge and Mountville (currently where Snickersville Turnpike crosses Goose Creek). This skirmish was a prelude to the Battle of Unison, which was a series of cavalry fights in Loudoun from Oct. 31-Nov. 2, 1862 between J.E.B. Stuart’s Confederate army and units of the Union Army. Riding with Stuart was a young scout and staff officer who was seeing Loudoun for the first time: John Singleton Mosby who would become widely known as the “grey ghost” for his daring exploits as a partisan ranger. Folens added, “This is such a special place; it’s so serene but so close to Middleburg. I designed it to have a luxurious feel for people who appreciate nice design.” Sounds pretty tempting. 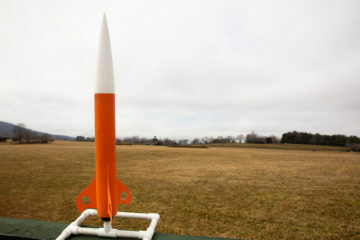 Hunter’s Retreat is located at 37568 Berryman Lane in Middleburg. To stay overnight at this Airbnb, visit www.airbnb.com. For information on NF Interiors, visit www.nfinteriors.com or call 703-444-6642. The Facebook page is www.facebook.com/nfinteriors.